Amanda is a widowed mother who has given up on finding love again. But when her sister-in-law marries Roan, Dai is thrust into her world. The attraction is instant, but both are wary. Amanda hasn’t been with a man since her husband died seven years ago and her first priority has to be her severely asthmatic daughter. Dai isn’t sure he even knows how to love or be loved. He’s never been with a woman. Even before he was thrust into the Shadowland, he was a Roman slave –tortured not only physically, but also sexually and emotionally. I really enjoyed watching the love story unfold between these two. While the attraction was immediate, the feelings and relationship developed more slowly and believably. Dai is the more dominant character in the story –and by that I mean, more of it is devoted to him. He’s got a lot to work out. Not only with his past and his intimacy issues, but with his magic. He studied magic for centuries, as he tried to break the goblin curse and now he must figure out how this, too, will fit into his life. He is very damaged, but underneath, he is really a good man. I liked this book a lot. It is the second in the Shadowlands series. 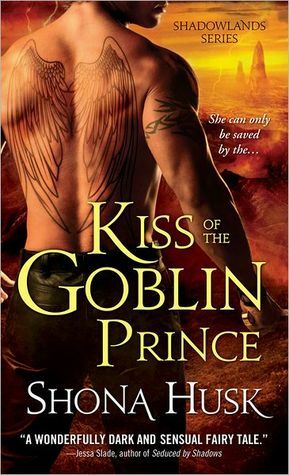 Unfortunately, I did not read The Goblin King and I felt it in a big way. There were huge, huge gaps in Dai and Roan’s backstory that must have been explained in the first installment. I was lost in the particulars of their curse –specifically, who cursed them? How does the goblin summoning thing work? In what circumstances could they come and go from the Shadowlands in the past? Stuff like that. The nagging questions distracted me from the good stuff on several occasions, which is a shame, because the romance part was right up my alley. Overall, I did like it. But I bet I would have liked it even more if I had read the first book. I don’t know, Heather. You might be better off finishing the first one, so you don’t feel the gaps like I did.